Citation Information: J Clin Invest. 1999;103(6):773-778. https://doi.org/10.1172/JCI5624. The earliest recognizable atherosclerotic lesions are fatty streaks composed of lipid-laden macrophages (foam cells). Circulating monocytes are the precursors of these foam cells, but the molecular mechanisms that govern macrophage trafficking through the vessel wall are poorly understood. Monocyte chemoattractant protein-1 (MCP-1), a member of the chemokine (chemotactic cytokine) family, is a potent monocyte agonist that is upregulated by oxidized lipids. Recent studies in hypercholesterolemic mice lacking apo E or the low-density lipoprotein receptor have suggested a role for MCP-1 in monocyte recruitment to early atherosclerotic lesions. To determine if MCP-1 is critically involved in atherogenesis in the setting of elevated physiological plasma cholesterol levels, we deleted the MCP-1 gene in transgenic mice expressing human apo B. Here we report that the absence of MCP-1 provides dramatic protection from macrophage recruitment and atherosclerotic lesion formation in apo B transgenic mice, without altering lipoprotein metabolism. Taken together with the results of earlier studies, these data provide compelling evidence that MCP-1 plays a critical role in the initiation of atherosclerosis. Atherosclerotic lesion area in MCP-1+/+HuBTg+/0 and MCP-1–/–HuBTg+/0 mice. Microscopic cross sections (10 μm) of the proximal aortic root were stained with oil red O to reveal lipids and quantitated by digital morphometry. Each symbol represents the average lesion area of a single animal; the bar indicates the mean of the group. 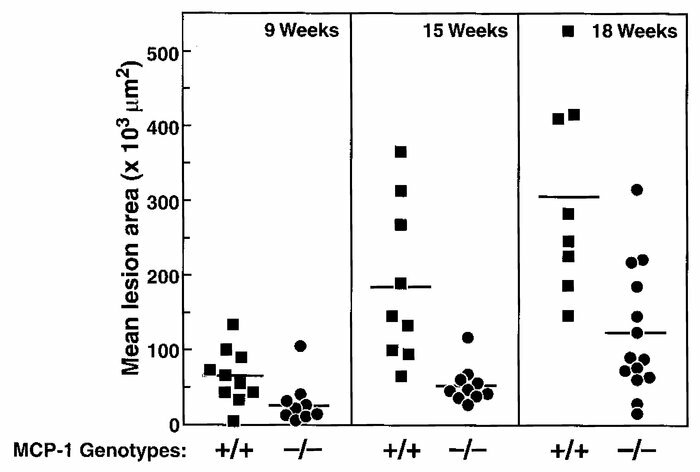 At each time, MCP-1+/+HuBTg+/0 mice had a significantly larger mean lesion area than MCP-1–/–HuBTg+/0 mice: 64,606 vs. 25,886 μm2 at 9 weeks (n = 11; P = 0.0083); 185,772 vs. 53,027 μm2 (n ≥ 9; P = 0.0001) at 15 weeks; and 305,790 vs. 123,025 μm2 at 18 weeks (n ≥ 8; P = 0.0009). MCP-1, monocyte chemoattractant protein-1.